We had a good day today on day 3 of our trip. Sunshine all day and easy walking. More importantly after yesterday, no bog! Had breakfast at 7.30 am despite having trouble dragging Al out of the bar last night. No change there then! The breakfasts at Keld Lodge were excellent and set us up for the day. We were off by 8.20am and by 8.30 I was taking photos. 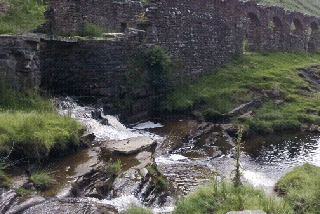 Keld is waterfall country. Kisdon Force was the first fall and is in several sections. All of them make good photos with the top one being the highest. Lots of big views as we walked along. The next photo stop was a ruined mine building next to a couple of pretty waterfalls. See mobile phone pic below. The country after this was quite scarred by mining. Ruined buildings, lime kilns and hillsides with no vegetation because of the methods used in lead mining. Lots of ruined buildings at the Old Gang Smelting Mill. Then it was a few miles through typical dales scenery to Reeth. Quite beautiful today. We stopped at the first pub, as you would expect, the Buck Hotel. Jolly nice Copper Dragon Bitter, Timothy Taylor Landlord and Black Sheep Bitter, plus 2 that aren’t my favourites. 3 pubs within 50 yards, 2 Theakstons and 1 freehouse. Trying the Old Peculiar at the Black Bull at the moment. About 42 miles in 3 days so far. Pretty easy walking except 9 Standards Rigg peat bog yesterday. Fleshpots of Richmond tomorrow (the one in North Yorkshire!). Once again no phone signal so relying on wifi in pub.